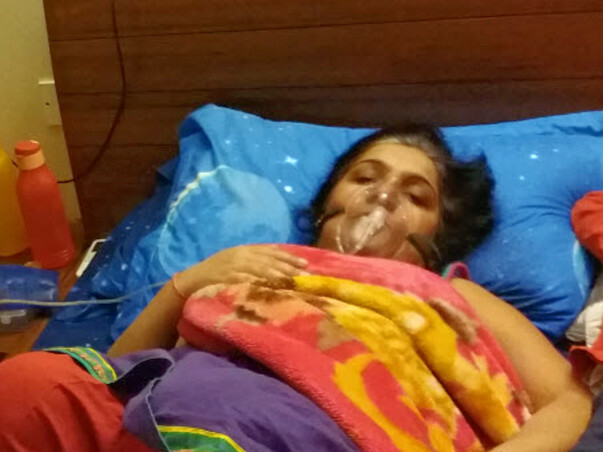 My spouse, Neha, is suffering from multiple medical ailments from last 3.9 years and complete bed ridden for last 1.5 years. Last 3 years of treatment for my spouse has been very demanding in terms of financials, physical & emotionally. I am currently in lot of debts owing to the medical expenditure and not able to find financial help for further treatment. I have used all my savings, Provident Funds, & finances from family, friends, other sources till now to cover for medical expenses. 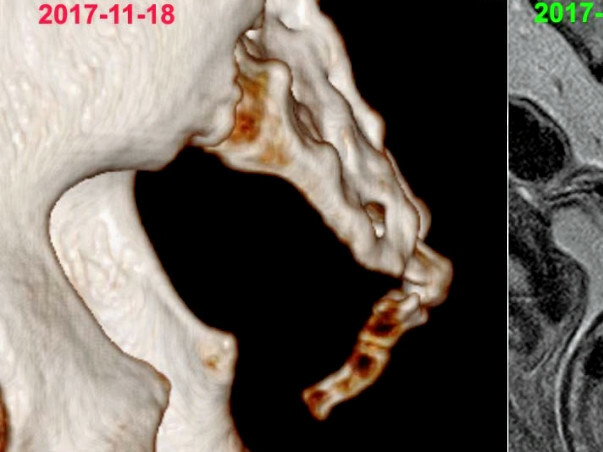 Now I am in need of financial support for further treatment of my spouse which is expected to go on for another 6-8 months as recovery is slow owing to the nature of the medical ailments. Despite having a respectable job with a multinational, yet, due to the scale, frequency, sheer duration and cyclical repetition of the healthcare expenses involved, we find ourselves near completely drained, having used up our savings, provident funds, credit-lines via short-term bank loans/credit card. 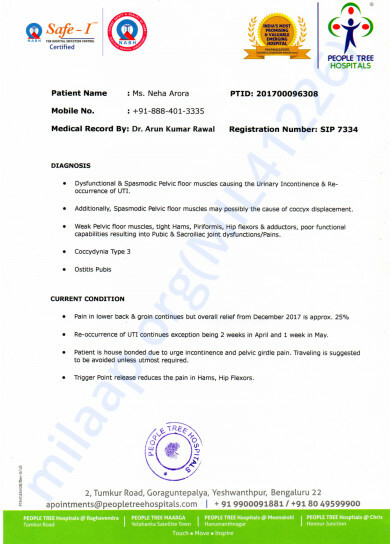 We are in acute shortfall of INR 30 Lacs (viz., INR 03 million) to cover Neha’s treatment expenses expected to continue for another 06 – 08 months as per the highly experienced doctors attending to her – recovery is slow due to the multiplicity of the health issues but doctors have assured of full recovery in 07-08 months. 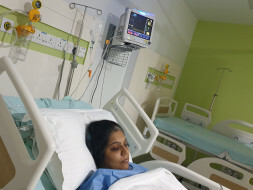 Our insurance healthcare covers is completely unusable as Neha cannot be admitted in hospitals due to her acute low immunity level resulting inclusively, from very long administration of continuous antibiotics. As per the expert doctors treating her, she has an extremely high probability of acquiring HAI’s (hospital acquired infections) if admitted. Total Expected Expenses for next 06 – 08 months : approx. INR 30 Lacs / viz., approx.. INR 03 million. To add to our woes, sustained physical, financial and mental stress managing my wife’s treatment, our son, my office & our home affairs all by myself and that too, since so long, has taken a very significant toll on my own health – historical ailments of hypertension, kidney stone and thyroid imbalances have shot up and I am also suffering badly from a knee ligament tear, a.k.a. ACL tear and meniscus tear in both my knees. 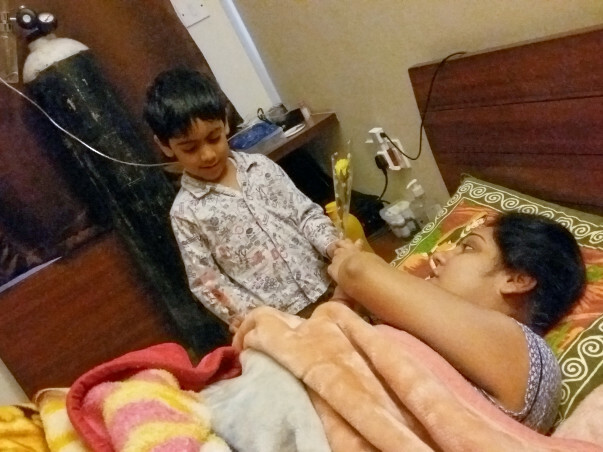 Long years of acute suffering, enormous stress on overall environment and tremendous strain on resources has been affecting Neha psychologically and almost scarring her… Her emotional pain due to her rather mindful guilt of neglecting our dear son Yashmit is driving her increasingly off late towards giving up all hope. Tragically, I myself is leaving hope as I do not have funds to take care of her medical treatments. In sheer desperation, I am reaching out to you all. PLEASE, PLEASE, PLEASE RENDER ANY FINANCIAL ASSISTANCE FEASIBLE TO THE BEST OF YOUR ABILITIES SO THAT AT LEAST MY WIFE’S LIFE AND OUR DEAR SON YASHMIT CAN HOPE FOR A FUTURE TOGETHER. 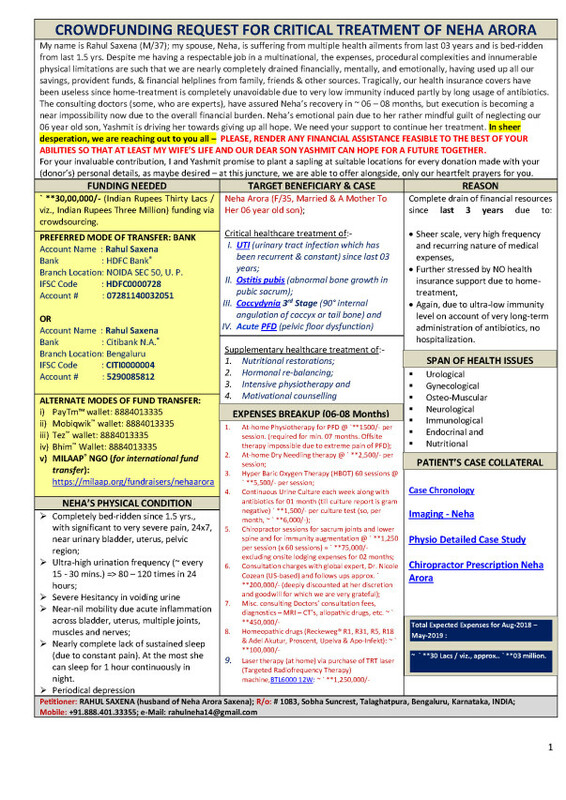 Below are all the doctors prescriptions and case study of Neha. Please support to the best of your capabilities. For your invaluable contribution, I and Yashmit promise to plant a sapling at suitable locations for every donation made with your (donor’s) personal details, as maybe desired – at this juncture, we are able to offer alongside, only our heartfelt prayers for you. 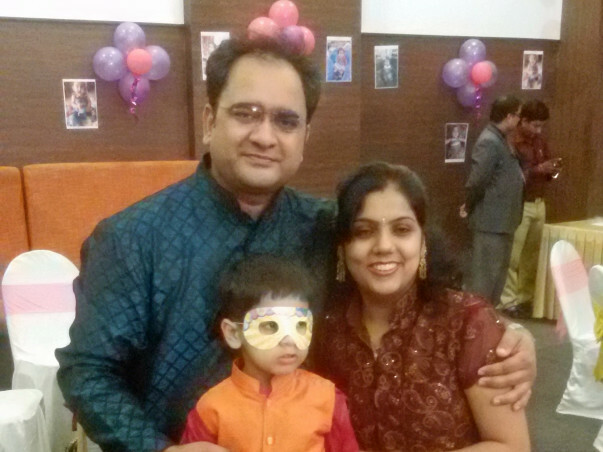 Neha underwent the rare Pelvic Floor Surgery in February. This was the 1st surgery amongst the list of treatments / surgeries planned for Neha. Please continue to pray for her and support her. A small contribution goes a big way to plan her future surgeries. 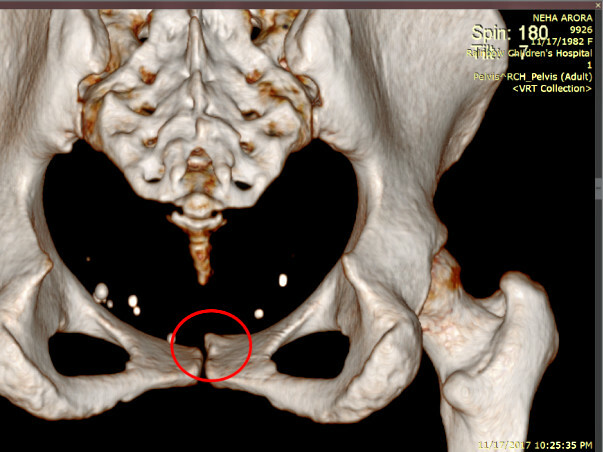 • [DONE] Pelvic Floor Surgery to Relax the whole pelvic floor. • [Due in April] Laparoscopy for Endometriosis. 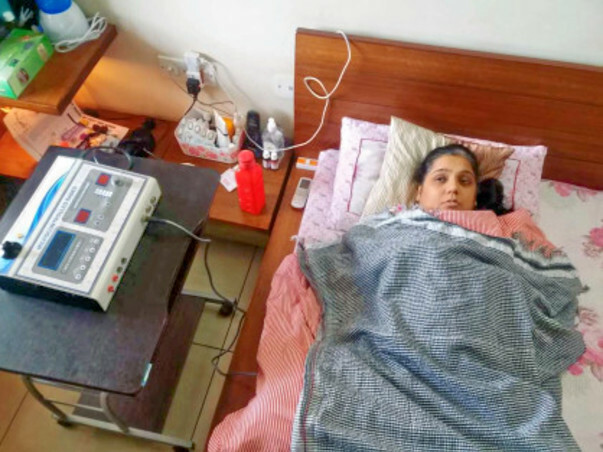 • 45 Sessions of Hyper Baric Oxygen Therapy for giving strength to her body cells after 2 years of continuous antibiotics & restoring her immunity levels. • Continuous supervision of a Nutritionist for her dietary plans for 4-5 months. • Continuous Bed Care Assistant to take care of the patient with her daily routines considering she is bed ridden. I, on behalf of Neha, wish to express my sincere gratitude for your valuable concern extended to us. With the meaningful contribution and support of many friends like you, we have been able to continue the treatments of Neha. Considering the present set of challenges we are facing in funding our programs, I am requesting you to donate to show your kind gesture towards Neha. I hope you would continue to show your love, care and support for her and help us to continue her treatments. To bring Neha out of this chronic pelvic pain, the 1st step is to relax the pelvic floor muscle. There are very few doctors in the world who can perform this surgery. Until December we were unable to locate any doctor in India who could do that and to bring a doctor from US to India to do that was costing almost Rs. 85 Lacs which was not possible for us to bear. By God’s grace, we were able to find a Government Doctor Dr. Kiran Ashok in Bangalore who is skilled, competent enough to do this surgery. He is the only doctor in India who can do this surgery. 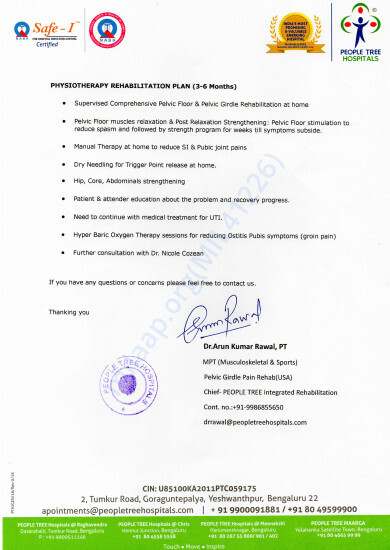 Neha will be operated for Pelvic Floor by 2nd week of February by Dr. Kiran Ashok. Post this she will be having a surgery for Endometriosis. Combined with these 2 surgeries Neha should be better by 70%. 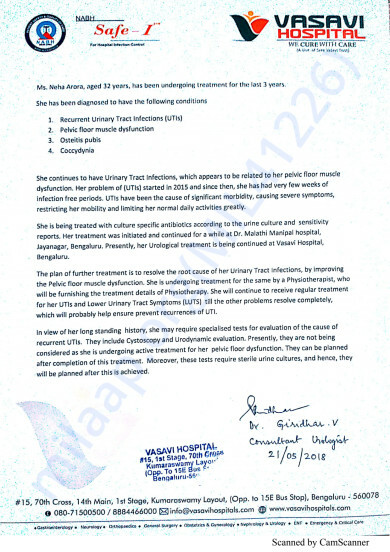 Once her pain level comes down & urinary infection stops, then we will have to wait for improvement in Urinary Bladder which is very much reduced in size with thickened walls. If the bladder does not relaxes on its own then she will be having surgeries of Bladder Insitillation to relax the bladder. After then she will be operated for Spine as she is having L5S1 disc bulge with Nerve Root Compression. Major recovery is expected after first 2 surgeries. Total time more required for her complete recovery is dependent on how her body reacts to these surgeries.. But doctors are estimating around 3-4 months. Kindly consider your valuable contribution. 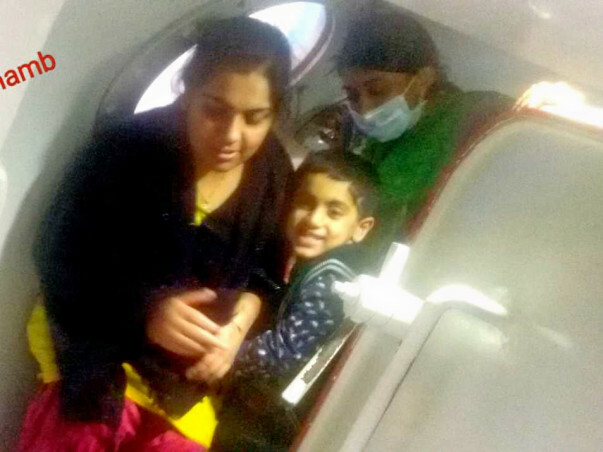 The doctor who has to do the surgery for Neha just called and informed that there has been an emergency at his home and he will not be able to perform the surgery today. He will confirm later when he will do the surgery for Neha. I will keep you updated.